Moreau F1, Yang R2, Nambiar V3, Demchuk AM4, Dunn JF5. Near-infrared measurements of brain oxygenation in stroke. Neurophotonics. 2016 Jul;3(3):031403. doi: 10.1117/1.NPh.3.3.031403. Epub 2016 Feb 11. You are having a stroke. Luckily you know “FAST” an acronym that stand for Facial drooping, Arm weakness, Speech difficulties and Time. These are key symptoms. You or a friend called for an ambulance. “Time is brain”. The quicker you obtain treatment the better. The current care is to arrive at a hospital and have CT imaging quickly. The CT will tell whether there is bleeding. Some CT’s give an excellent view of the size of the stroke. What the doctor doesn’t know, is how severe the stroke is within the stroke region. A stroke is a low flow condition. The blood oxygen carrying protein—hemoglobin—looses oxygen. The tissue becomes hypoxic (low oxygen). The severity of the hypoxia is likely to relate to outcome. CT doesn’t tell you much about severity. So, is there another option? NIRS involves shining light into the brain and measuring the light coming back. In effect, we are measuring the color of the blood as it goes from the red oxygenated blood to blue deoxygenated blood. This provides us with a measure of how hypoxic the brain is. 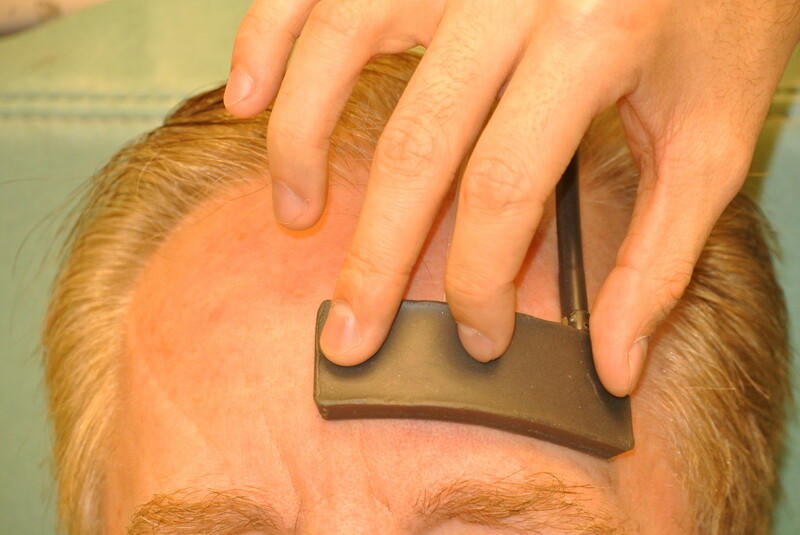 The photo shows me with a NIRS pad placed on the forehead. The fibres are fibre optics that carry the light to and from the head. This year we published one of the first attempts to apply NIRS in the hectic acute care setting of a stroke patient arriving at the hospital. We used a NIRS method called frequency domain spectroscopy, which adds the key ability to quantify oxygenation between subjects. With this, in a few seconds, we could obtain a measure of the level of oxygenation in the brain of the patient. We could get a marker of severity. This was a small pilot project to show proof of principle. Thanks to the journal “Neurophotonics” (http://spie.org/publications/journals/neurophotonics) for letting us publish this observational study. In future, perhaps a NIRS measurement will be used in an ambulance to help assess the severity of the stroke even before arriving in emergency.